A powerful storm system stretched from Texas to Minnesota on Sunday, bringing heavy rains, flash flooding and the possibility of more severe weather. Rain-soaked North Texas saw flash flood warnings, high-water rescues and motorists stranded on roads overwhelmed by torrential rains. 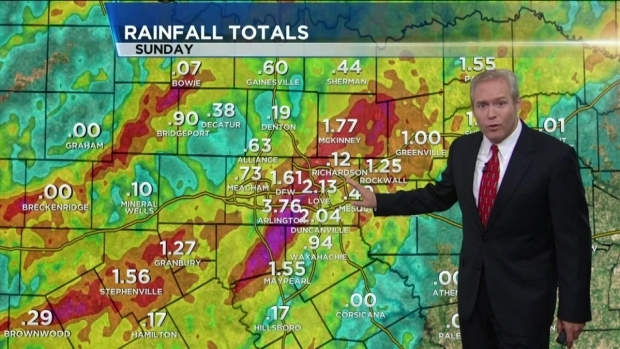 Meteorologist Brian James talks about the rainfall totals after storms moved through North Texas overnight. The Dallas-Fort Worth area received between 3 to 5 inches of rain overnight, according to National Weather Service senior meteorologist Eric Martello, and total rainfall is running about 5 inches above normal for this time of year. In the Johnson County town of Venus people had to be rescued from their homes. Chopper 5 surveyed the flooding in Johnson County and found cows stranded by high water, clustered together on the only piece of land they could find. Chopper 5 found several cows stranded in high water as it toured Johnson County flooding. There's clear evidence of the amount of rainfall overnight at Lynn Creek Marina at Joe Pool Lake. Chopper 5 flew over there area where cars parked along the boat ramp are underwater and paths to docks are underwater. Chopper 5 flew over the marina at Cedar Hill State Park on Joe Pool Lake which is flooded after rain overnight. In Grand Prairie, Cottonwood Creek flooded the roads nearby. Police put up barricades to keep people from driving through the high water on the roadway. Cottonwood Creek in Grand Prairie flooded Sunday morning. Police barricaded the area to keep people from driving into the high water. It's the same story in Oklahoma, where a river in the northwest part of the state threatened to top its banks and affected crops, oil wells and rural roads. "We've gotten a lot of rain in a short time," Oklahoma Department of Emergency Management spokeswoman Keli Cain said. "The ground is saturated, so every time we get another big soaking, the rain causes more flash flooding." Damaging tornadoes and strong winds blew through the Plains on Saturday and early Sunday, though there were no reports of deaths or injuries. The dangerous weather was centered in southwestern Oklahoma, where tornadoes touched down near Elmer and Tipton, National Weather Service forecaster Daryl Williams said. The most significant damage, according to Oklahoma emergency officials, was to homes, businesses and power lines.